“The Crusher was born out of the need to fill the gap of a single multi-functional speed control that could accommodate a multitude of applications — rock crawlers, rock racers, short course, and even the heavy-duty RC applications that have no category,” says Novak, and judging by the press info, it looks like the Crusher truly is a do-it-all speed control. The latest X-Drive firmware is on board, and the Crusher is 4S capable. Get the speed control by itself, or in combination with a Ballistic motor–see below. Comment on the Crusher system in our Hot News & New Stuff forum, or join us on Facebook. The Crusher was born out of the need to fill the gap of a single multi-functional speed control that could accommodate a multitude of applications — rock crawlers, rock racers, short course, and even the heavy-duty RC applications that have no category! 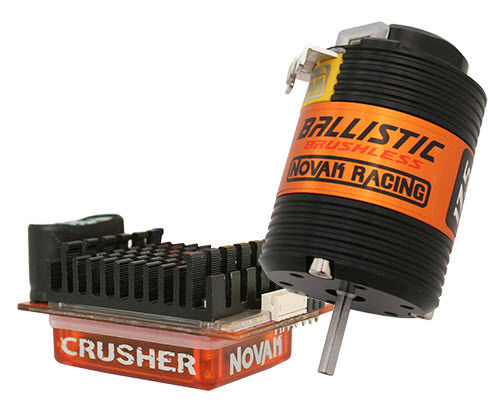 The Novak Crusher 2S, 3S, and 4S-rated, sensor-based brushless ESC fills that gap, and provides amazing power, response and speed at your fingertips. With auto-detect LiPo sensing and complete onboard programming, the Crusher brings a new level of user-friendly operation and on-the-spot adjustability. The Crusher is wired and ready to install. It includes a replaceable receiver harness, a full coverage heat sink, cooling fan, and its sealed case design means the Crusher is ready to rock right out of the box! CRAWLING MODE: When used with Novak rock crawling brushless motors, the Crusher can operate in instant-reverse or Crawling Mode. This mode has proven to be a favorite among brushless rock crawlers and offers unique braking and forward/reverse operation that has no reverse delay, which allows instant reverse! This mode also features Novak’s exclusive powered hill/hold/drag brake when used with a Novak crawling motor. The powered hill/hold/drag provides the strongest automatic neutral point brakes to date. This means even the heaviest of vehicles will hold on the steepest of inclines. The 100% pure sensor-based design ensures ultra-fine, low speed control, and non-stop torque throughout the throttle range. 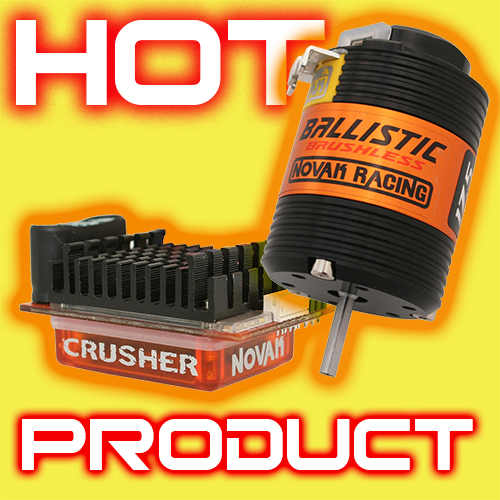 EXTREME SPORT MODE: When used with standard Novak brushless motors (or Novak crawling brushless motors) the Crusher is a full-featured bashing ESC for 2S, 3S, or 4S LiPo setups. The Crusher is not your typical bashing ESC with limited settings, lock out modes, or slimmed down construction. 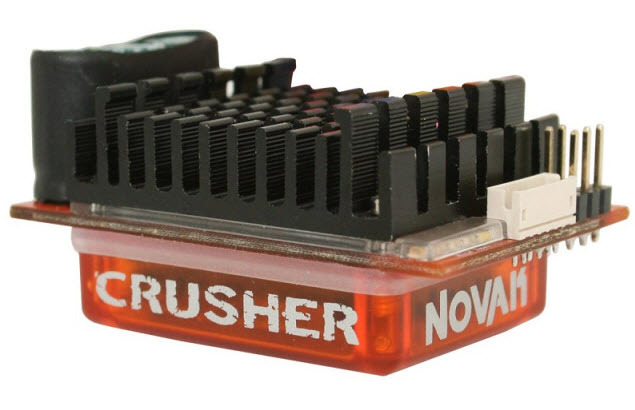 The Crusher is based on Novak’s pro race-level ESC platform, and has complete onboard adjustability with fan favorite default settings. The Crusher is suited for normal sized 540 motors, and will handle the larger 550 motors with ease as well.